Generations of girls have been inspired by Wonder Woman's power. She's a woman who does what needs to be done for the greater good. No matter how far gone someone is, she believes they can do better, they just need a little convincing with her lasso of truth. In fact, Wonder Woman's gear suits her battle style quite well. Take her shield for instance. Wonder Woman can do amazing things with her shield. The mass of metal blocks more than just a couple arrows, it can prevent of battalion of heavy fire, it can stop a large explosion from even harming her. When used the right way she can even use it to launch herself to amazing heights. 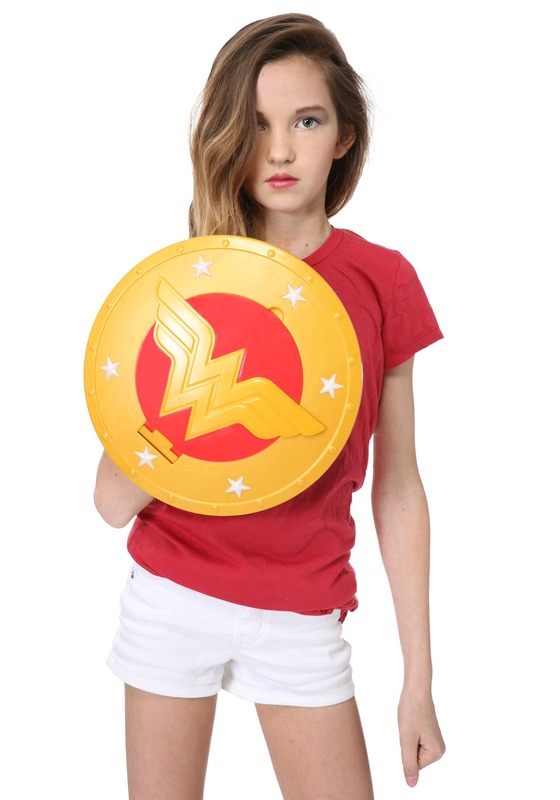 If your daughter is getting a kick out of playing Wonder Woman than she'll need a little something to protect her from the forces of evil. The gold and red shield will not only protect her from whatever comes her way, be it foam darts or water balloons but it also gives her the ability to shoot discs up to twenty feet. She may not have powers given to her directly by Zeus but she certainly has the power to keep those bad guys under control.